Embrace all the flavors of love! Our beloved chocolate Lacta and The Mall of Cyprus once again invite you to this year’s Valentine’s Celebration, embracing all flavors of love. We look forward to seeing for you on 9 and 10 February, at Entrance 2 of the shopping center. Mix FM will be joining us for a fun Live Link. Add your own Valentine’s message on the two huge heart-shaped signs, and enter the “actforlove” competition! Our grand winner, who will be announced on Valentine’s Day, will enjoy a trip for two to magical Paris. 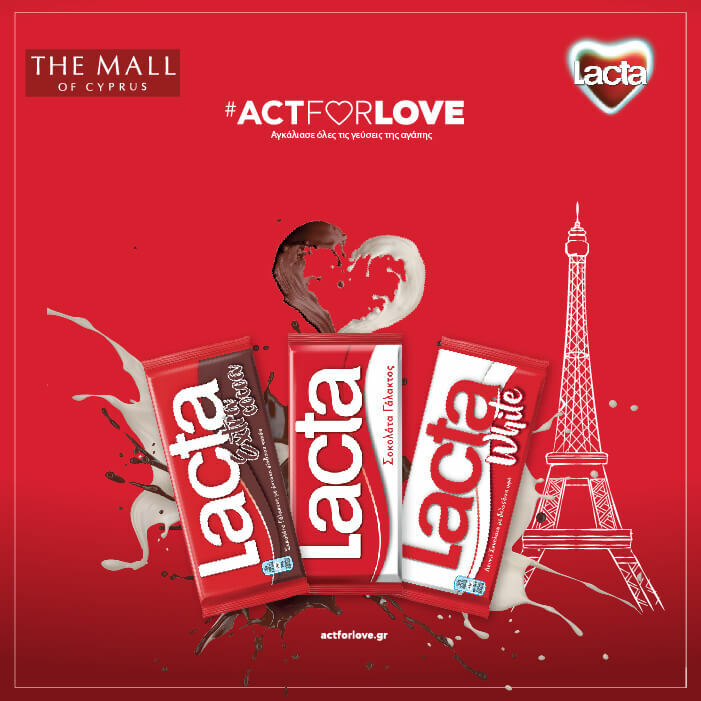 Five more winners will get a romantic dinner for two at TGI Fridays at The Mall of Cyprus, and twenty winners will get Lacta chocolate sets. Lacta and The Mall of Cyprus have once again prepared an unforgettable Valentine’s event! We look forward to seeing you on Saturday and Sunday 9 and 10 February, between 3pm and 8pm, at The Mall of Cyprus! Visit actforlove.gr in order to learn more about the Lacta campaign.